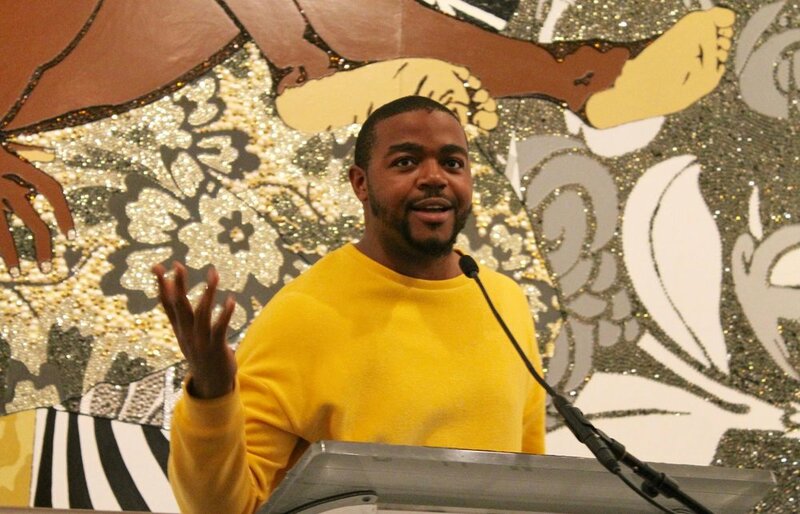 Hear 2017 Cave Canem Poetry Prize winner Julian Randall read from his debut Refuse(University of Pittsburgh Press, 2018). Vievee Francis, Darrel Alejandro Holnes, honorable mention for Stepmotherland, and Shayla Lawson, honorable mention for Ti Ador(n)0, kick off the evening with introductory readings. On Friday, November 16, 2018, 7:30 PM Come hear poets Darrel Alejandro Holnes, Hadara Bar-Nadav, Pamela Sneed read for Brooklyn Poets at 100 Bogart St, Bushwick, Brooklyn, NY! Bird of Pray, Festival Premiere at The Brick Theater! BIRD OF PRAY - Shaquille's attempt at suicide is disrupted when Jem, the ghost of a fellow soldier killed for being gay, suddenly appears and makes a proposition: Shaq must share his body with Jem's soul instead of sacrificing it to the vultures in exchange for absolution. With an impending hurricane forcing his hand, Shaquille must quickly choose between saving a fellow soldier he failed to save at war or escaping his worldly problems by starting over in the afterlife. This theatrical journey into PTSD explores the hidden corners of American history and the legacy of Don't Ask Don't Tell through magical realism, dialogue, and dance. Bird of Pray is the first chapter in Darrel Alejandro Holnes' Sandstorm Cycle, a series of plays based on Holnes' interviews with African American veterans of recent US wars in the Middle East and elsewhere abroad. Mimi Barcomi directs this dynamic festival premiere with movement by Jonathan González. The play is produced by Margaret Champagne and features Cornelius Davidson in the role of Shaquille and Devante Lewis in the role of Jem. The production stage manager is Nat DiMario. The play was developed in residency at The Collective NY with the support of the Arch and Bruce Brown Foundation and various private donors. Presented by The Collective NY with the generous support of The Arch & Bruce Brown Foundation. Sanguine Theater Company presents Playwrights Week at IDT Theater. 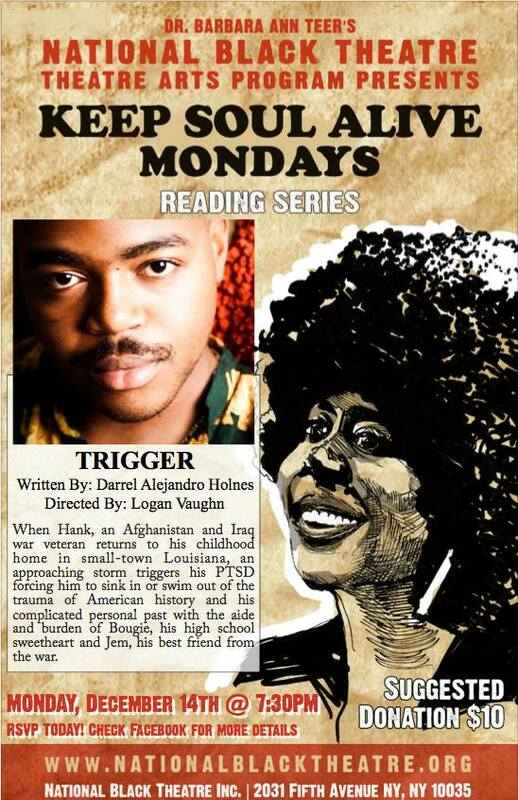 A reading of The Tragedy of Othello: The Moor of the NFL, an adaptation by playwright Darrel Alejandro Holnes will be presented on Thursday, March 29th at 7pm. Directed by Emily Jackson. A reading of Starry Night at National Black Theater as part of its Keep Soul Alive! Reading Series featuring Demetrius Stewart and Antwayn Hopper. Left to right: Milton Lyles, Antwayn Hopper, Franklin Rankin, Demetrius Stewart, Darrel Alejandro Holnes. Left to right: Jose Angel Araguz, Christina Olivares, Darrel Alejandro Holnes, Peggy Robles-Alvarado, Lupe Mendez. Darrel Alejandro Holnes and Jessica Lanay Moore read poems that traverse literary styles and transcend borders. Presented in partnership with Cave Canem Foundation, committed to cultivating the artistic and professional growth of black poets. Listen to the in-studio reading and interview with writer Darrel Alejandro Holnes, originally aired on April 16, 2017 on Studio A. Holnes is a poet and a playwright from Panama and a professor at NYU and Medgar Evers College. His poems can be found at American Poetry Review, Poetry Magazine, Callaloo, Best American Experimental Writing, and elsewhere in print and online. He is the co-author of PRIME: Poetry & Conversations, and the co-editor of Happiness, The Delight-Tree: An Anthology of Contemporary International Poetry in honor of the United Nations International Day of Happiness. He was a recent finalist for the Split This Rock! National Poetry Contest. In addition to his writing, Holnes is also a researcher who conducted ethnographic interviews for the Surviving Katrina and Rita in Houston (SKRH) project directed by Dr. Carl Lindahl and Pat Jasper, PhD, in partnership with the American Folklife Center at the Library of Congress and the University of Houston. He presented his fieldwork and research for SKRH at the American Folklore Society’s Annual Meeting with the Folklore Studies Association of Canada in Quebec City, Canada. Holnes and members of the SKRH team were featured in TIME Magazine as “Innovative Storytellers” for their work on the project. Holnes then co-produced radio programs, using excerpts of his ethnographic interviews, which aired on NPR affiliate stations throughout the Gulf Coast region. His lively personality and wide range of life experience help to craft his undeniably enthralling poetry. Join Split This Rock and Tia Chucha Press as we present this brand-new anthology of Central American writers living in the United States. The Wandering Song features work that captures the complexity of a rapidly growing community that shares certain experiences with other Latino groups, but also offers its own unique narrative. This is the first-ever comprehensive literary survey of the Central American diaspora by a U.S. publisher, perfect for high school, college, or university courses in U.S. literature, Latino Literature, Multicultural Studies, and Migration Studies. Join Soul Sister Revue for Winter Show show at the Hi-Fi Bar, as we say BoyBye to 2016 and ask "How cool is your soul?" Readers include Sabrina Hayeem-Ladani, Darrel Alejandro Holnes, Cory Nakasue, José Olivarez, and María Fernanda Snellings along with superfly host Ed Toney. Inspired by a performative reading of acclaimed poet, Derek Walcott’s, “A Far Cry from Africa," the festival will premiere plays by 7 commissioned playwrights, who have written their responses to Walcott’s piece: Dennis A. Allen II (Black-American), France-Luce Benson (Haitian-American), Kemiyondo Coutinho (Nomadic African), Donette Lavinia Grays(African-American), Darrel Alejandro Holnes (Afro-Latino), Velina Hasu Houston, Aroji Otieno (Kenyan). SHELL SHOCKED by Darrel Alejandro Holnes, directed by Mfoniso Udofia. 9 Sibling Rivalry Press poets will read at this New York City based fund-raiser for their newly nonprofit press. Monetary donations will be collected at the event, and their will be a silent auction, including items to bid on such as a collection of signed copies of all the readers’ books and three signed copies of the out-of-print chapbook Burnings by Ocean Vuong. Poet, producer and playwright Darrel Alejandro Holnes will give a reading at Noon Wednesday, April 16 at Linn-Benton Community College’s Forum building, room F-104, 6500 Pacific Blvd SW, Albany. An award-winning poet and playwright from Panama City, Panama, Holnes holds degrees in Creative Writing from the University of Michigan and the University of Houston. Holnes’ poems have been featured in Callaloo, Journal of African Diaspora, Occupy Wall Street Poetry Anthology, The Paris-American, The Prague Review, The Queer South, and other prestigious journals and presses. A writer, educator and activist, Holnes is the recipient of scholarships to Bread Loaf Writers’ Conference, Cave Canem, CantoMundo and the VCFA Postgraduate Writer’s Conference. This event is free and open to the public, and sponsored by LBCC’s Gay-Straight Alliance, Diversity Achievement Center, and Council of Clubs, with a grant from LBCC’s English Endowment Fund. Split This Rock 2016 Poetry Festival! Come hear Abena Busia, Mahnaz Afkhami, Evie Shockley, Darrel Alejandro Holnes, Sara Goudarzi, Robert Gibbons, and Elizabeth Lara read in support of women’s rights. Emotive Fruition + Cave Canem: A Night of Love Poems - Poems are performed as part of a lively performance series where actors bring to life new page poetry for the stage. This performance featured poems of a select group of Cave Canem poets. Antwayn Hopper, Bryan T. Clark, Suzette Azariah Gunn, Lance Coadie Williams. TRIGGER: When Hank, an Afghanistan and Iraq war veteran returns to his childhood home in small-town Louisiana, an approaching storm triggers his PTSD forcing him to sink in or swim out of the trauma of American history and his complicated personal past with the aide and burden of Bougie, his high school sweetheart and Jem, his best friend from the war. 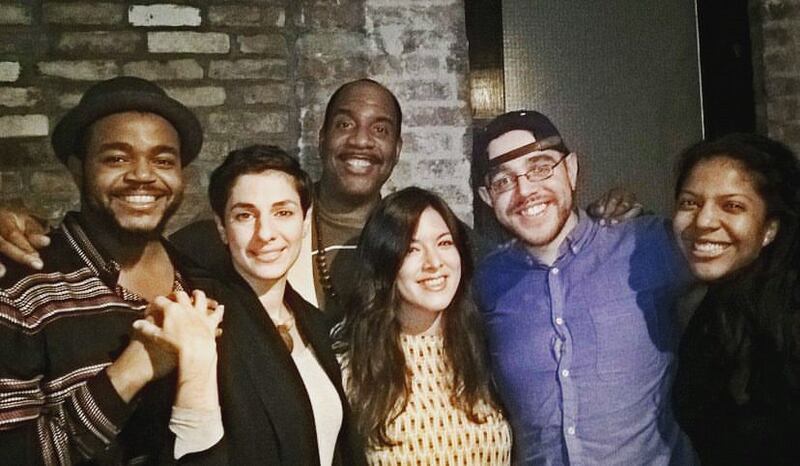 A reading featuring Mark Doty, Darrel Alejandro Holnes, Javier Zamora, Meena Alexander. Winter Tangerine is proud to present "Remembrance", a poetry reading featuring contributors from our online Spotlight feature, Hands Up Don't Shoot. Poets will perform pieces that explore the complexities of what it means to be black in America. Remembrance will feature Joshua Aiken, Jeremy Clark, Julian Randall, Diamond Sharp, and Darrel Alejandro Holnes, Cortney Charleston. The event will be MC'd by poet Jayson Smith. This event will be at the Nuyorican Poets Cafe in New York City on August 8th from 5PM-8PM. Cover is $11. Remembrance is part of Winter Tangerine's "Poets in NYC" reading series, a group of fundraisers for the relaunch of Winter Tangerine at the end of the year.